3M 08115 Panel Bonding Adhesive, 200 mL Cartridge. STRIPE OFF WHEEL/ERASER WHEEL WITH HARDWARE. Designed for high-speed removal of vinyl decals graphics and double sided molding striping and trim. Use on tools with 4000 RPM. MOS: optimum speed is 2000 RPM plus or minus 200. 1 1/2" X 60 yards. 6 rolls per sleeve. 3 ROLLS 1.5" YELLOW & 6 ROLLS OF 3/4" YELLOW. for great deals. NEW 3M 39008 HEADLIGHT LENS RESTORATION SYSTEM. Utilizes the muscle power of a common household (1200-1600 rpm) drill to do all the necessary sanding and buffing. This item is not for sale in Catalina Island. Trending at $15.79eBay determines this price through a machine learned model of the product's sale prices within the last 90 days. You will get exactly what you see in the picture. 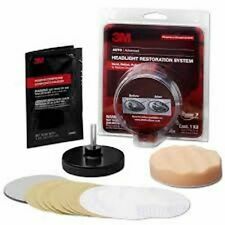 3M Perfect it Buffing & Polishing Kit 39060, 39061/39062/05723/05725/05751/ 6017. Rather than using ineffective solvents — or spending big on new headlight lenses — you can choose our 3M™ Headlight Lens Restoration Kits. A complete system of light abrasives, polishes and protectants removes scratches, dirt and oxidization that can appear on your lenses, lowering your vehicle's value and reducing safe driving visibility. 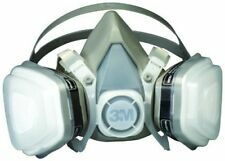 NIOSH Approved Solvent and Particulate Respirator. We enjoy providing the Midwest with the highest quality auto body products on the market. We are a distributor for 3M, Dewalt, Makita, Milwaukee, Milton, Lisle, Irwin, U-Pol, SEM, GearWrench, Norton, Microflex, Wizard, Evercoat, Forever Black and Tool Aid. The Many Benefits of Scotch-Brite™ Abrasives. Reusable pad resists tearing, splintering, loading and will never rust, providing a long, useful life. Great Multipurpose Pad. Use a progressive system of Trizact abrasive discs to remove yellowing, scratches, dirt, haze, and other material buildup on the plastic lens. Then, using a soft cloth, apply a light coating of 3M Synthetic Wax Protectant. It can be used to bond automotive weatherstripping and is a great adhesive for holding paper, cork, or rubber gaskets in place during installation. Net Weight: 180g. Auto Magic Clay Bar detailing clay bar 180 gram, fine. Work contaminated areas with 3M™ Perfect-It™ III Cleaner Clay using light pressure and the 3M ™ Car Wash Shampoo (or other car wash shampoo) as a lubricant. 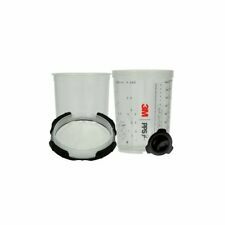 This kit includes 1 hard cup in standard size (22 ounces/650ml), 10 lids (200 micron), 10 liners, and 4 plugs. Compare to similar kits with only 6 liners that cost more. 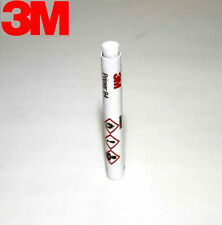 3M 8571 Manual Applicator 08571- 200 mL, works with 8115/8116 Adhesive. 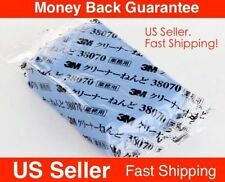 5 out of 5 stars - 3M 8571 Manual Applicator 08571- 200 mL, works with 8115/8116 Adhesive. 16 product ratings16 product ratings - 3M 8571 Manual Applicator 08571- 200 mL, works with 8115/8116 Adhesive. 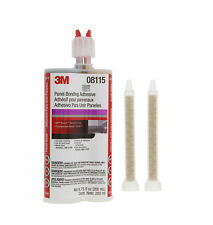 3M 38315 Panel Bonding Adhesive - 47.5 ml. 3M 08946 Silicone Clear Paste. Thick paste. Excellent dielectric lubricant. Conditions rubber. Contains no solvents. for great deals. Providing Quality to Professionals. You will receive 4 Very fine & 4 Ultra fine 3M Scotch-Brite's. Superior alternative to steel wool , wire brushes, sandpaper, and other nonwoven products for cleaning or finishing tasks. and will never rust, providing a long, useful life. Bonds to fabric, headliners, and foam. NO P.O. BOXES. 3M 08852 Cavity Wax Plus, 18.7 oz. 5 out of 5 stars - 3M 08852 Cavity Wax Plus, 18.7 oz. 5 product ratings5 product ratings - 3M 08852 Cavity Wax Plus, 18.7 oz. 3M 39173 Quick Headlight Clear Coat. Can provide 10X clarity for twice as long, when used with 3M Headlight Restoration Kits. Can be applied on new headlight lenses, or as a last step in headlight restoration. 4.5 out of 5 stars - (3) PACKS 3M 39173 QUICK HEADLIGHT CLEAR COAT EXTREME UV PROTECTION FREE SHIP!! 4 product ratings4 product ratings - (3) PACKS 3M 39173 QUICK HEADLIGHT CLEAR COAT EXTREME UV PROTECTION FREE SHIP!! 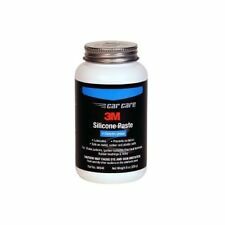 3M 8945 Brake Lube / Anti-Seize, Copper, 9 oz 08945. 1 Sleeve/6 Rolls - 3M™ - Yellow Masking Tape - 1 1/2"
Automotive Refinish Masking Tape is designed for masking before painting It bends and stretches to follow curved body lines with no edge lifting, leaves sharp paint lines, removes easily with no adhesive transfer. 5 out of 5 stars - 1 Sleeve/6 Rolls - 3M™ - Yellow Masking Tape - 1 1/2"
2 product ratings2 product ratings - 1 Sleeve/6 Rolls - 3M™ - Yellow Masking Tape - 1 1/2"
Breathing organic vapors can pose a risk to your health. 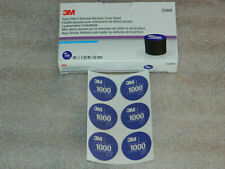 3M6001 ORGANIC VAPOR. Organic Vapor. Gas & Vapor Protection Type. ■ NIOSH approved for protection against certain organic vapors. ■ Bayonet compatibility allows use with many 3M half and full facepiece designs. 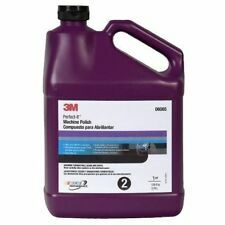 3M 06064 Perfect-It Machine Polish (1 Quart). Fiberglass resin, liquid hardener, fiberglass mat, plastic spreader, mixing stick, mixing tray and instruction booklet included. This simple two-part solution includes a resin-based filler and a hardener. A tube of the hardener is included with Bondo Body Filler. This fast-curing body filler spreads easily and will adhere to correctly prepared surfaces. Bondo Fiberglass Repair Kit 420 has everything needed for the Do-It-Yourselfer, including easy how-to directions, fiberglass resin, liquid hardener, plastic spreader, fiberglass cloth, mixing stick and mixing tray. This includes everything you need to apply the 8116. Both the adhesive and the applicator are new and have not been opened. This is new-product and has not been sitting on the shelf! 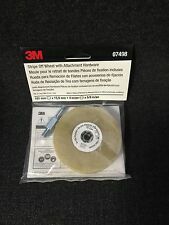 5 out of 5 stars - 3M 8116 PANEL BONDING ADHESIVE W/8571 APPLICATOR. 10 product ratings10 product ratings - 3M 8116 PANEL BONDING ADHESIVE W/8571 APPLICATOR. Qty 1 P3000: Part #02085 (Condition New). Qty 1 P5000: Part #30662 (Condition New). Qty 1 P1000: Part #02090 (Condition New). Get started with the second generation disposable liner system. This kit includes 1 hard cup in minisize (6.5 ounces/200ml), 10 lids (200 micron), 10 liners, and 4 plugs. You will need the proper 2.0 adapter to fit your gun, and this system is not compatible with the original style adapters. 3M Dynatron 550 Auto Seam Sealer Grey Caulk - 12 oz. Dynatron™ Auto Seam Sealer Grey Caulk is a fast-skinning, permanently elastic, non-sagging formulation that is brushable and paintable. It dries quickly with little shrinkage. Our sealer creates a water-tight repair that stay in place without cracking. 4.5 out of 5 stars - 3M Dynatron 550 Auto Seam Sealer Grey Caulk - 12 oz. 15 product ratings15 product ratings - 3M Dynatron 550 Auto Seam Sealer Grey Caulk - 12 oz. You will receive one (1) 2” x 12” strip. Full 10 count package shown for reference only.